Description: This monument depicts a Confederate Common Soldier placed atop a tall Corinthian styled column. Both statue and column are composed of light granite. The soldier stands at attention with the Confederate flag at his side. The base of the monument is large and grand with large arched slabs of stone extending from the four corners outward to short columns on each corner. The initials of the Confederacy, "C.S.A. ", are in bas-relief at the base of the tall column with the bas-relief image of three rifles below on the front of the base. The smooth front face to the left and right of the rifles is inscribed along with the three remaining faces of the base. Two shallow steps lead to the base. Originally the statue of a soldier sat atop each of the short columns at the base. These were removed over time by vandalism and wear. Front, base of column: C.S.A. THE NAMES OF THE CONFEDERATE SOLDIERS / FROM NASH COUNTY CAN BE FOUND IN THE / MEMORIAL VOLUME OF THE VARIOUS LIBRARIES / OF THE STATE AND THE CLERKS OFFICE OF NASH / COUNTY N.C. THIS MONUMENT IS COMMITTED TO THE / CARE OF BETHEL HEROES CHAPTER / U.D.C. WHO WITH THEIR SISTER DAUGHTERS / ARE PRESERVERS OF SOUTHERN IDEALS. Unveiling & Dedication: The monument was dedicated on May 14, 1917 in Riverside Park. A procession began at the Ricks Hotel led by mounted marshals, the 1st N.C. Regiment Band, five troops of Boy Scouts, the Junior Bethel Heroes Chapter, three troops of Girl Scouts, school children, and automobiles. "America" and "Bonnie Blue Flag" were sung by children. Governor Bickett delivered the address, and the monument was unveiled by R. H. Ricks and Richard Thorp. Following the service, a "genuine Nash County barbecue dinner" was served. Post dedication use: In 1921, the Bethel Heroes Chapter of the United Daughters of the Confederacy planted sixteen trees marked with bronze tablets in memory of the descendants of veterans in an effort to beautify the monument grounds. Subject notes: Rocky Mount was the site of Rocky Mills, a large mill complex begun in 1818. Slave labor provided the manpower until 1852. On July 20, 1863, the mills were targeted by Union General Edward E. Potter with six companies dispatched to the destroy them. The monument was sponsored by Colonel R. H. Ricks, a Rocky Mount native and Confederate veteran, who donated funds for its purchase and installation. The monument originally had four soldiers mounted on the short columns at the base. In 2012, the local Bethel Heroes Chapter of the United Daughters of the Confederacy began an effort under their president, Ellie Lee, to raise funds to restore the monument. As of 2012, this effort was still in progress. In 1976 another restoration effort took place, and the monument was re-dedicated at that time to veterans of all wars from Nash and Edgecombe counties. Location: The monument is located in Riverside Park on the east side of Falls Road in Rocky Mount. It is located several feet from the curb and faces generally north. 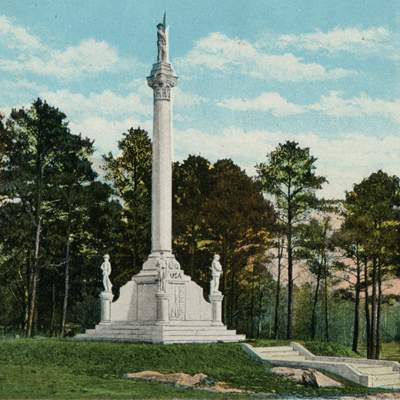 Landscape: The monument sits in a grassy area alongside the road and is surrounded by woods. In a great democratic country like the US, traitors like Jefferson Davis, Robert Lee or others that are considered heroes by those in the south have not deserved commemorations. Monuments, statues or other marks that glorify their heroism only open the wounds of the past that must buried once and for all. To allow those monuments to stay is like the German, the Russian or the Cambodian to glorify Hitler, Stalin or Polpot!